• Calendula is a commonly used ingredient in oral and healthcare products. • It can be used in form or Oil, ointment or drinking tea. • It should be used under medical supervision if you are pregnant, and allergic to anything. 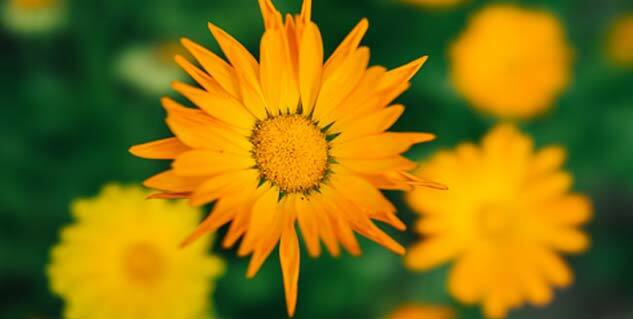 Calendula is an herbal plant, and its flowers are used for preparation of medicines especially homeopathic medicines. There are many health benefits of calendula flower but it is best known as health and beauty remedy. The plant’s natural astringent and antibiotic properties make it great for healing minor wounds, skin ulcers, burns (including sunburn), bruises and even insect bites and stings. Calendula flower has certain anti-bacterial properties because of which you will find this in the ingredients list of herbal health and hygiene products like, toothpaste, mouth wash. Oral health products that contain calendula are very effective in killing bacteria that leads to everything from gingivitis to cavities. If you are suffering from inflammation of any type (external / internal), use calendula ointment on external inflammation or you can also consume calendula tea for internal problems. Regardless of where you are suffering from inflammation, use of calendula can significantly reduce the discomfort. If you are suffering from cough or congestion, calendula tea is the best remedy. In case of joint affected by arthritis or gout then adding some calendula oil to skin balm can rapidly reduce the pain. In case of stomach upsets, calendula helps normalize any gastrointestinal system and eliminate any inflammation that may be causing discomfort. Consumption of calendula tea helps women during those discomforting days of menstruation. It helps in regulating and easing the menstrual cycle. It further helps in reducing the pain and discomforting symptoms that most women experience during their periods such as abdominal cramps and spasm. It also effectively reduces nausea and headaches associated with the menstrual cycle. With calendula skin care properties, it helps in preventing premature aging of skin while its restorative properties help in hydrating the skin and making it look younger and soft by healing damaged skin cells. Aside from stimulating healing, you can make use of calendula oil to significantly boost the appearance of your skin. It also helps improve blood flow to the skin cells and provides antioxidant protection that reduces the appearance of wrinkles and age spots, and even the visibility of scars. In fact, this herbal calendula ointment or oil is safe enough to be used on the delicate area around the eyes to treat puffiness. Calendula oil is very useful in treating dandruff infected hair by hydrating the dry scalp. Also, dandruff is the major cause of hair fall and damaged scalp. There generative properties of calendula oil help the hair follicles to grow abundantly and hair to grow stronger and thicker.